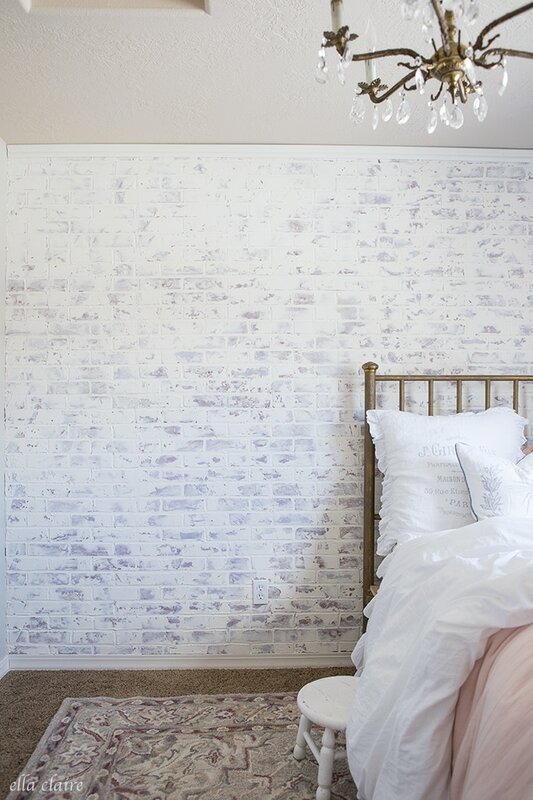 When I was finishing up Ella’s sweet little girl’s room, I wanted to add a little bit of character with an accent wall. 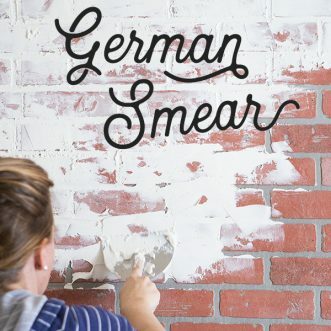 I had originally planned on adding wallpaper or even board and batten, but instead I opted for this fun German Smear/ German Schmear faux brick wall. My friend had done it with her girls in their room and it turned out so pretty so I asked her for all of her pointers. I show in this tutorial how to do a version that has more red brick showing through as well as this one above with a gray and whitewash. 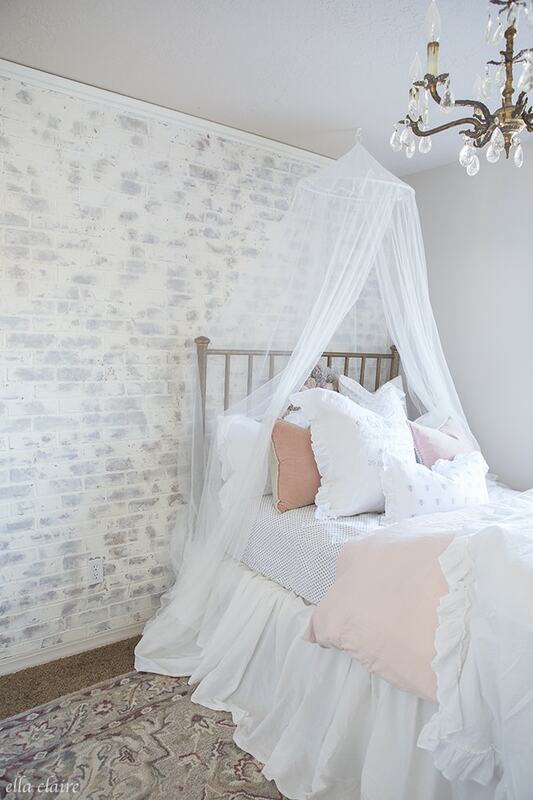 It adds so much texture and european charm to the space and Ella is positive it makes her room the “castle” now. 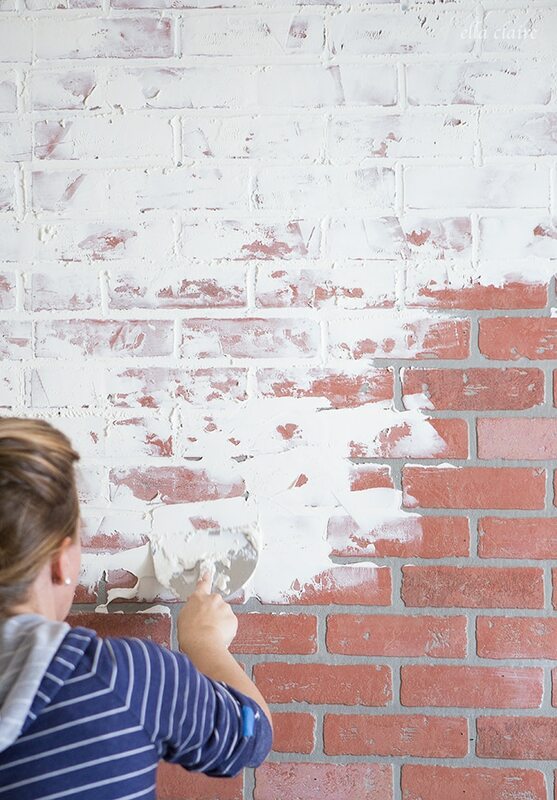 My friend even spoiled us and came over and did all of the spackling! 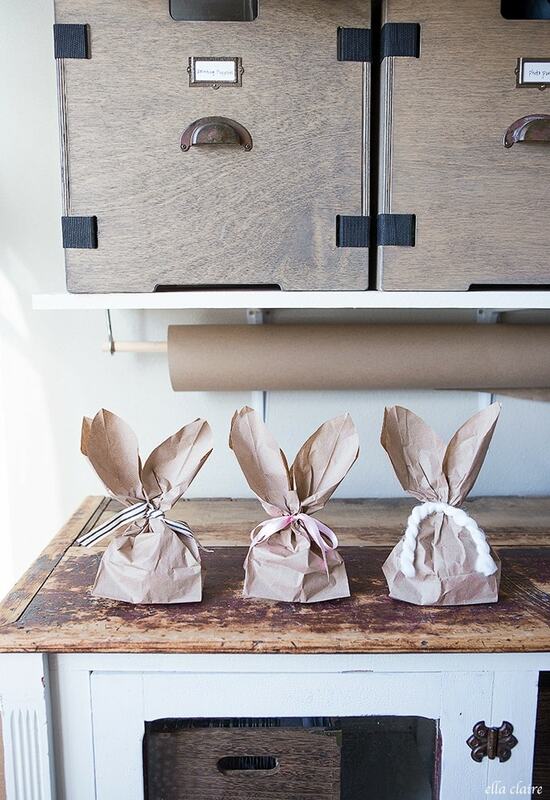 I hope you have a room in your home for this one because it is a fun one! 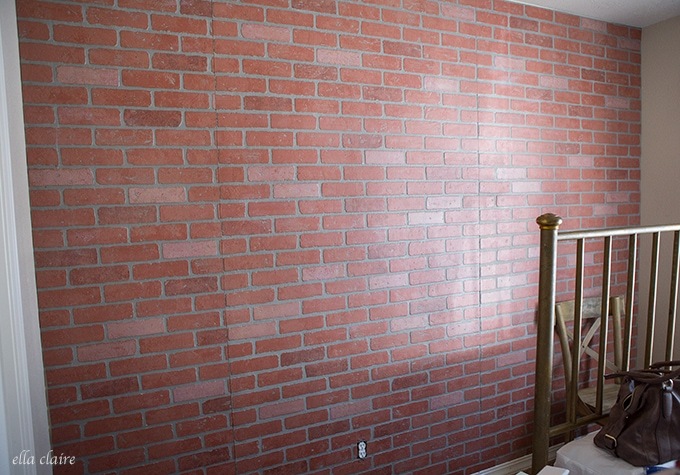 First, I installed faux brick panels from The Home Depot. I had the store cut one of the pieces down for me but my wall was uneven so I ended up trimming it more with my hand held jigsaw. It actually cut pretty easily, so don’t be intimidated! I installed it very similar to our beadboard backsplash with the help of my dad (including how we cut around the outlet), so you can see that full tutorial HERE. I used liquid nails on the back of each panel and then pressed it firmly against the wall, pressing out any ripples from the floor up to the ceiling. I then shot it with a bunch of finish nails with my Ryobi Airstrike. Tape off the walls and baseboard. Working in small areas at a time (maybe 1 sq. 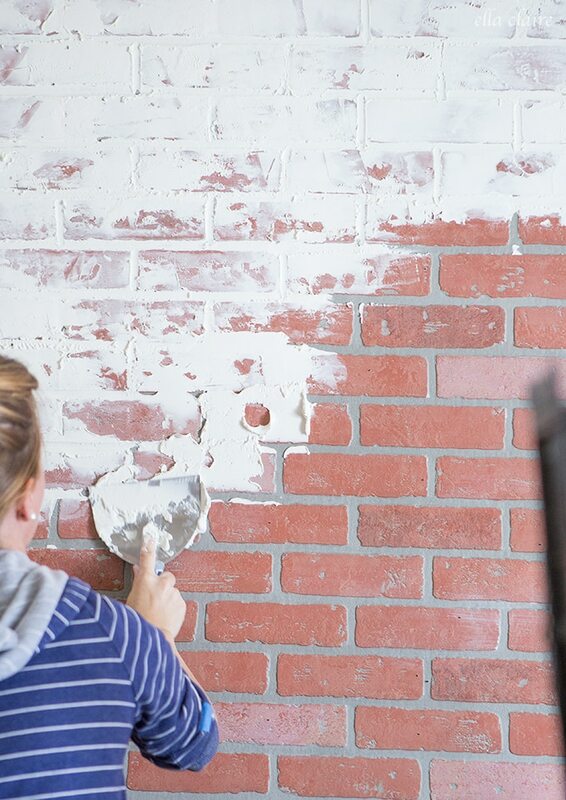 ft), scoop a good amount of spackle on joint knife and spread onto the wall, focusing on the grout lines, but overlapping the bricks. 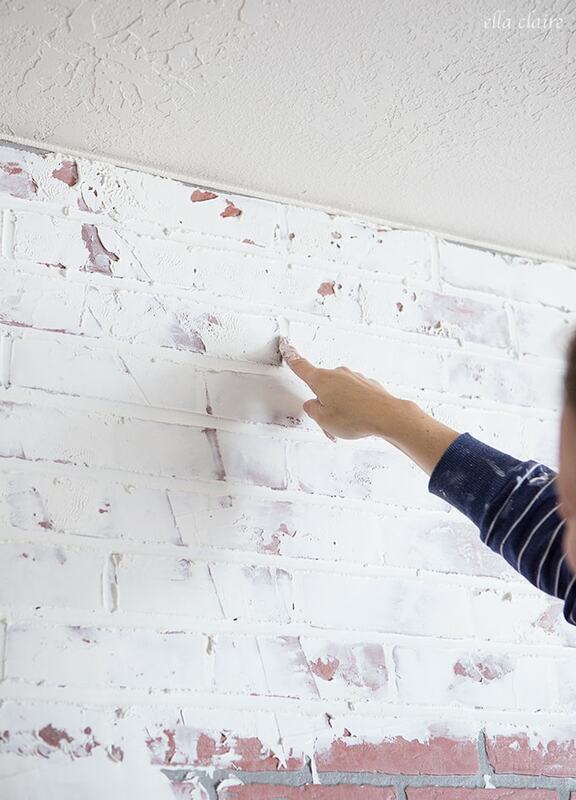 Using your knife, press up and down and side to side until grout lines are filled and bricks are covered in the desired amount of spackle. 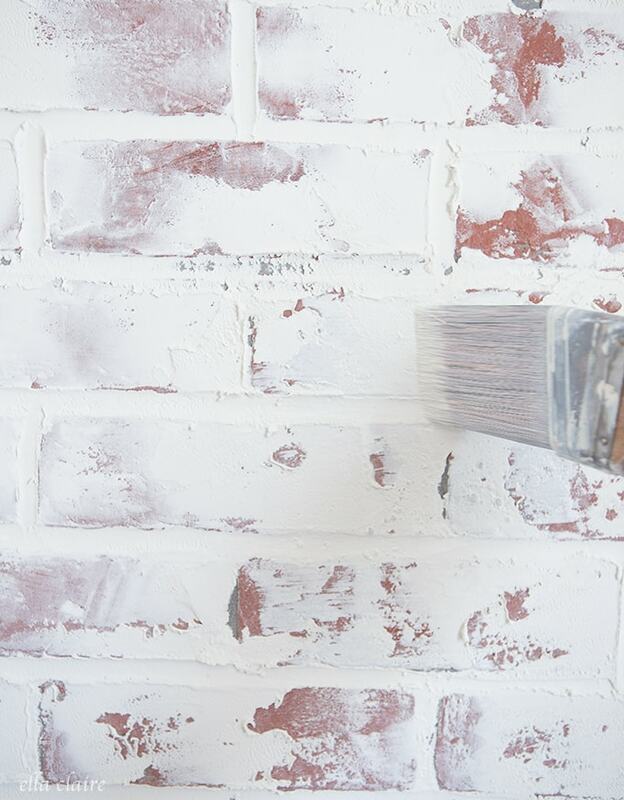 You can cover as little or as much as you would like depending on the look you are trying to achieve. 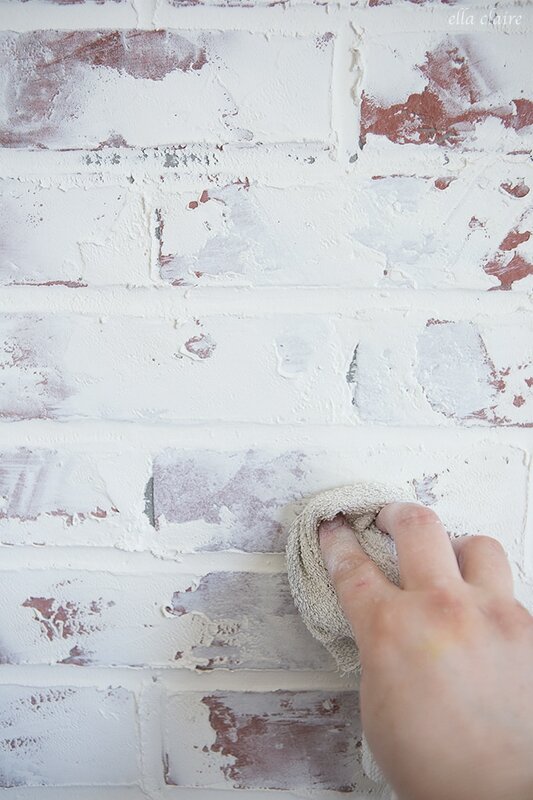 Accentuate grout lines by running finger along them. You will want to do all horizontal lines and then all verticals- don’t switch back and forth between the two. Repeat until the entire wall is covered. 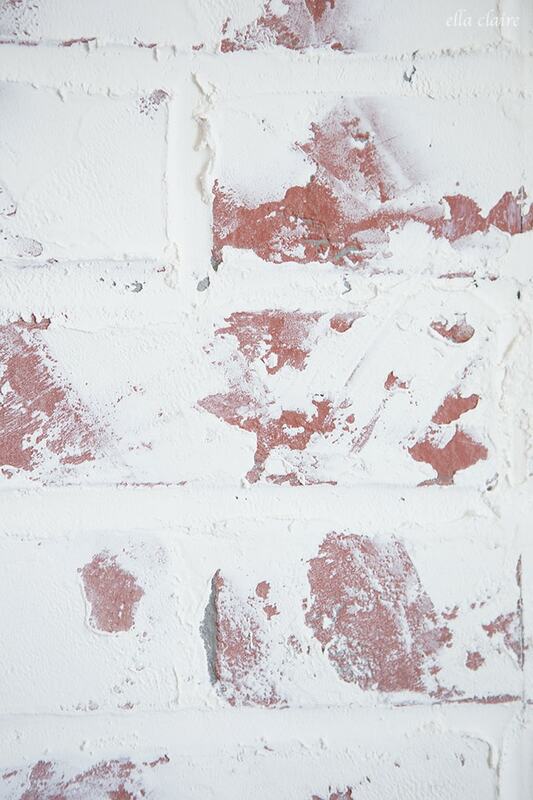 Here is what the bricks looked like when the spackle dried (before I put on the topcoat). I brushed the entire wall lightly with my hand to remove any loosely hanging spackle and vacuumed it up. 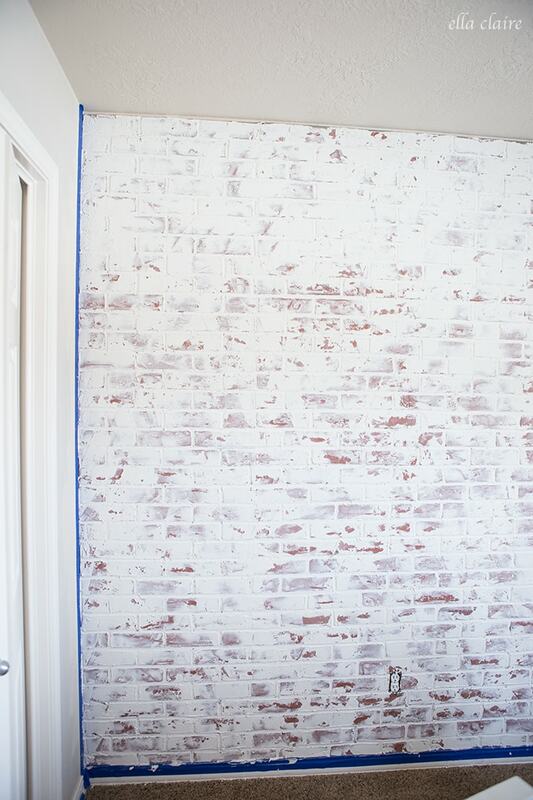 To seal in the spackle and add a little extra patina and texture, the next step is to whitewash the wall. I used a watered down creamy white paint that I had on hand (SW Dover White). I watered it down approx. 60% water/ 40% paint. 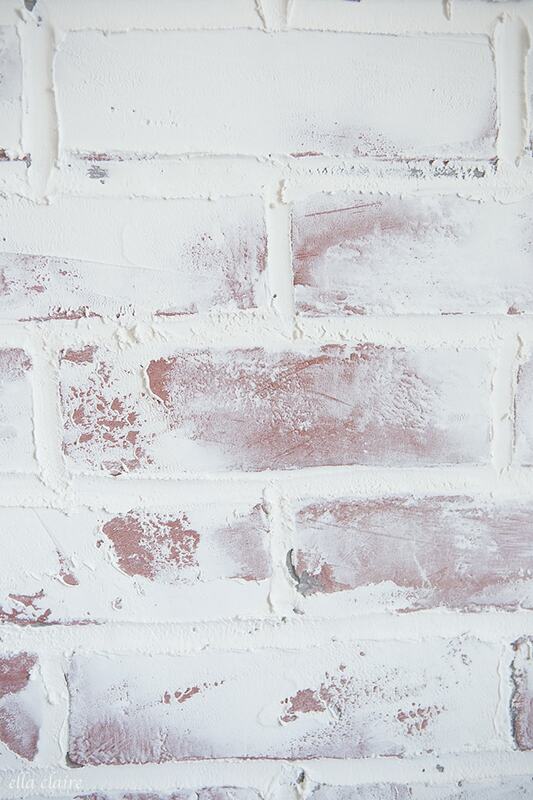 I painted it on the wall with a brush and then dabbed it with a textured rag on the brick areas. You can stop here and it is beautiful, but I wanted my wall to be a little more gray and less red because I felt like it was clashing with the pink bedding and dresser a little. I used the same technique as above but just painted a gray over the brick areas (MMS Milk Paint in Schloss) and then did one more coat of whitewash over the top of the whole thing. We love the way it turned out! I added a piece of trim to the top and will caulk it when we are ready to paint the ceiling. Overall, the project felt pretty simple and even though I worked on it in couple hour increments here and there, it didn’t seem to take a he amount of time. I highly recommend this project. I will share the rest of Ella’s room soon, so stay tuned! 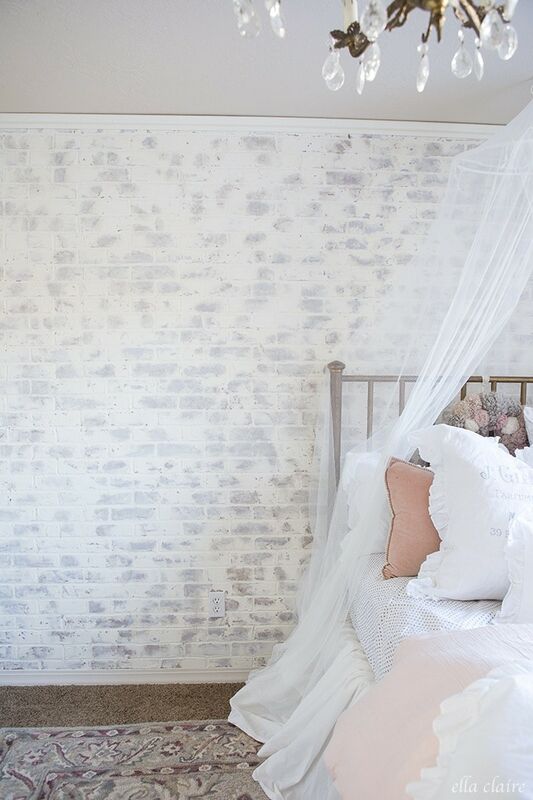 It is so fun having such a girly room in our home. 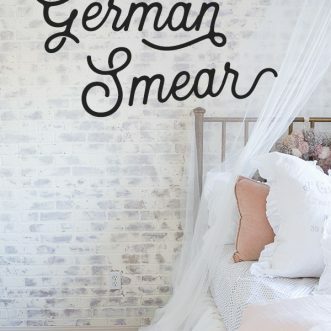 Would you add a German Schmear/ German Smear faux brick to a wall in your home? Kristen it looks beautiful! I have a wall in my kitchen that needs that treatment and thank you so much for the easy tutorial. They help so much. Ps. I used to get your emails all the time and have tried to sign up but I get the error that I’m already subscribing. I miss your posts, so can you fix that for me?